The new Olympus PEN E-PL1 is truly greater than the sum of its parts, with a surprisingly small camera body packed with technology normally found in bigger, bulkier and heavier professional Digital Single Lens Reflex (DSLR) cameras and High-Definition (HD) camcorders. This third-generation PEN is built for shutterbugs who always wanted better pictures and considered a DSLR, but were intimidated by the bulky size and complex interface. The new camera's simple design and easy interface enable photographers to easily create amazing images never dreamt possible. The E-PL1's new Live Guide interface simplifies great photography and gets the results you desire at the touch of a button. Want more vivid or muted color in your shot? Want warmer or cooler color? Want a brighter or darker subject, or a sharper or softer background? Or maybe you want to capture the fast-moving action of your subject with a little artistic blur, or perhaps freeze the action? Simply select Live Guide and press the up and down arrows on the back of the camera to slide through numerous photographic effects. Make adjustments and watch the LCD as the effects are made live before the image is captured! Don't worry about learning technical things like f-stops, shutter speed and white balance; jump right in by composing, adjusting exposure and more before the shot is taken. How do professional photographers capture the stunning images you see in the pages of glossy magazines and coffee-table books? Talent matters, of course, but you also need the right equipment. Rest assured that the E-PL1 has everything you need to produce vibrant, professional-quality images: a large image sensor, in-body Image Stabilization, Imager Autofocus, the proven Olympus Dust Reduction System and the TruePic V Image Processor. Instead of selling more expensive lenses that have image stabilization inside them, Olympus takes a different approach by having image stabilization built right into the body of the E-PL1. This means that any lens (Micro Four Thirds, Four Thirds and any third-party lens) attached to the E-PL1 will deliver blur-free images thanks to three modes of In-body Image Stabilization that automatically compensate for camera shake, including in low-light situations or when shooting without a tripod. Since the PEN cameras are the world's smallest interchangeable-lens cameras with image stabilization built inside the body, you can take the E-PL1 with you and capture great images, and it won't weigh you down. The E-PL1's Continuous Autofocus (C-AF) Tracking and Autofocus (AF) Target Registration locks your subject into focus and constantly adjusts focus and brightness whether you or your subject is moving. With this mode, a simple push of the shutter release enables you to keep moving subjects in focus--tracking them from left to right and from front to back--within the frame, automatically ensuring that even active subjects, like kids playing sports, are captured clearly. If you're just starting out with a camera that has interchangeable lenses, you don't have to worry about dust spots on your sensor ruining the perfect image every time you change lenses. Spend more time shooting with the E-PL1 and less time worrying about dust with the proven Olympus Dust Reduction System that produces spot-free photos with the exclusive Supersonic Wave Filter, a patented ultrasonic technology that vibrates to remove dust and other particles from the front of the image sensor, capturing them on a special adhesive membrane every time the camera is turned on. The E-PL1's Live MOS image sensor is complemented by Olympus' TruePic V Image Processor, which produces clear and colorful photos using all the pixel information for each image to provide the best digital images possible. The image processor is noted for accurate natural color, true-to-life flesh tones, brilliant blue skies and precise tonal expression; it also lowers image noise in photos shot at higher ISO settings (ISO 100 to ISO 3200), enabling great results in low-light situations. If you want to have even more options, the MMF-2 Four Thirds System Lens Adapter makes the E-PL1 compatible with all Olympus Zuiko Digital Specific lenses and other Four Thirds System lenses from Sigma, Panasonic and Leica. 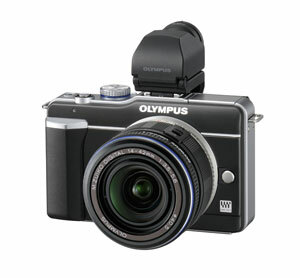 Olympus OM film-based lenses can be attached to the E-PL1 with the MF-2 OM Lens Adapter, and there are third-party adapters developed for lenses from most other manufacturers. Photographers who wish to hold the E-PL1 up to their eye rather than use the LCD will appreciate that the optional VF-2, which provides 1.15x magnification and a 100 percent field of view with sharp resolution, brightness and contrast. The viewfinder refreshes quickly to minimize image ghosting on fast-moving subjects. It also rotates up to 90 degrees to enable photographers to look down into it, which is useful when shooting subjects from challenging angles. The built-in diopter adjustment and high magnification offer easy viewing with and without glasses. 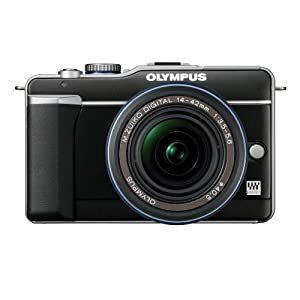 The E-PL1 streamlines the Olympus Micro Four Thirds PEN series form. Thanks to its compact size (4.51" W x 2.84" H x 1.63" D excluding protrusions) and light 10.4-ounce body, the E-PL1 won't weigh you down when you're on the go.